SASKATOON , Jan. 24, 2019 /CNW/ - George H. Read , P. Geo., Senior Vice President Exploration and Development of Star Diamond Corporation ("Star Diamond" or the "Corporation") is pleased to announce that Rio Tinto Exploration Canada ("RTEC") has commenced the sonic and core drilling of up to 25 pilot holes on the Orion South Kimberlite. The sonic drilling provides a detailed log of the overburden stratigraphy above the kimberlite, while the core holes are being drilled to generate detailed logs of the kimberlite geology at each locality in preparation for RTEC's bulk sampling with the Trench Cutter Sampling Rig. The Orion South Kimberlite is located within the Corporation's Star - Orion South Diamond Project, in the Fort à la Corne diamond district of central Saskatchewan, Canada , on mineral dispositions held 100 percent by Star Diamond . The sonic drilling is being conducted by Boart Longyear Inc. using two drill rigs, while the core drilling program is being conducted by George Downing Estate Drilling Ltd. also using two drill rigs. RTEC geologists are responsible for the supervision of the drilling programs. Detailed geotechnical logging of the core collected by the sonic rig is being completed by Clifton Associates Ltd. Star Diamond and RTEC geologists are in the process of completing the detailed core logging. Senior Vice President Exploration and Development, George Read , states: "Detailed logging of these pilot sonic and core holes is most important in order to understand the internal structure of the overburden and kimberlite to facilitate RTEC's bulk sampling. This detailed understanding of the internal structure of the kimberlite will ensure that kimberlite units with different diamond populations are collected as separate samples during the future bulk sampling." 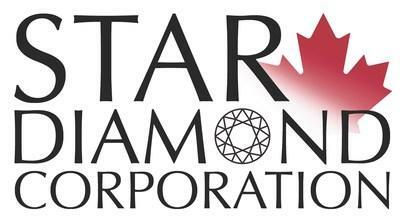 Star Diamond Corporation is a Canadian based corporation engaged in the acquisition, exploration and development of mineral properties. Shares of the Corporation trade on the TSX Exchange under the trading symbol "DIAM". The Corporation's Fort à la Corne kimberlites (including the Star - Orion South Diamond Project, or "Project") are located in central Saskatchewan in close proximity to established infrastructure, including paved highways and the electrical power grid, which provide significant advantages for future mine development. RTEC refers to Star Diamond's mineral dispositions in the Fort à la Corne diamond district as Project FalCon. All technical information in this press release has been prepared under the supervision of George Read, Senior Vice-President of Exploration and Development, a registered Professional Geoscientist in the Provinces of Saskatchewan and British Columbia and Mark Shimell, Project Manager, a registered Professional Geoscientist in the Province of Saskatchewan , who are the Corporation's "Qualified Persons" under the definition of NI 43-101. Forward-looking statements contained or implied in this press release include, but are not limited to, RTEC's and the Corporation's objectives for the ensuing year, including the proposed bulk sampling program.